Hydropower increase in 2018 is less than 21 GW or 17% less than in 2017 and signifies steady decline in this sector for the fifth year in a row. We have no data which part of capacity was added through modernization of old facilities, but expect it to be a sizeable share. 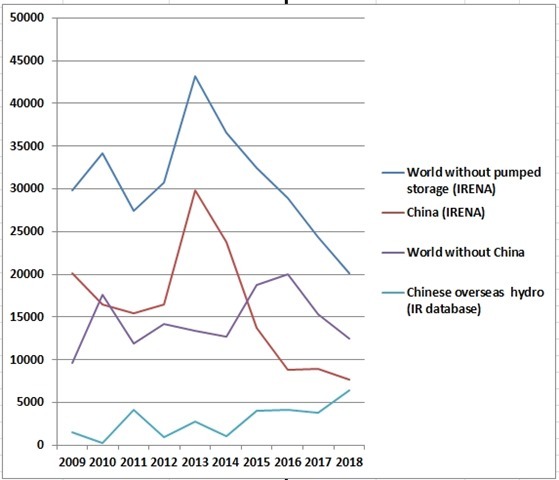 China leads in hydropower construction both domestically and overseas. And China Hydropower Association claimed in January that its members participate in 70% of actively developed projects around the world. However the hydro as such is less and less relevant to whichever development goals. 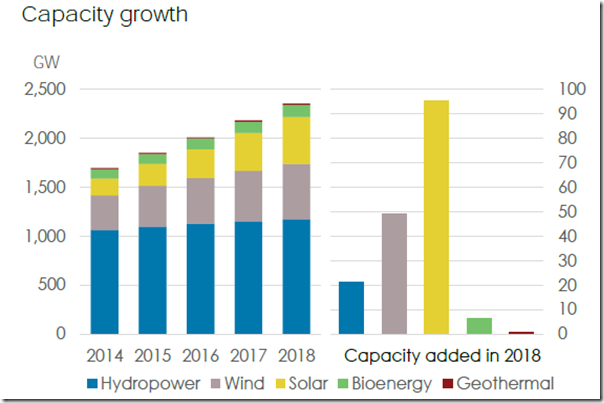 Renewable capacity expansion continues to be driven mostly by new installations of solar and wind energy. These accounted for 84% of all new capacity installed in 2018, finally pushing the overall share of hydro to just under 50% of non-fossil electricity sources. But destruction of environment and suppression of local communities caused by greenfield hydropower projects was still on the rise throughout 2018 from construction of Ilisu Dam on Tigris River in Turkey to forest clearing at the site of BatangToru dam in Indonesia. Accidents happened on many newly completed dams claiming lives of several hundred people and forcing many thousand people to evacuate. The International Agency on Renewable Energy (IRENA) released annual Renewable Capacity Statistics 2019, the most comprehensive, up-to-date and accessible figures on renewable energy capacity indicates growth in all regions of the world. 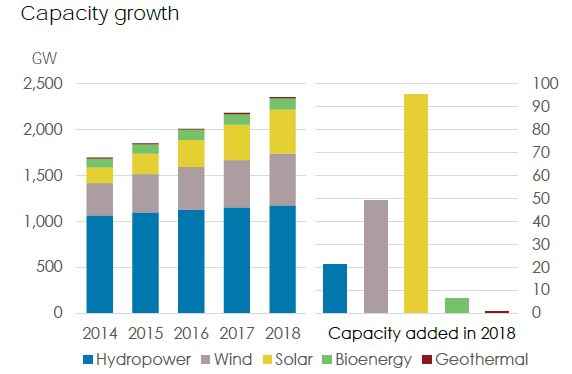 The decade-long trend of strong growth in renewable energy capacity continued in 2018 with global additions of 171 gigawatts (GW), according to new data released by the International Renewable Energy Agency (IRENA) today. The annual increase of 7.9 per cent was bolstered by new additions from solar and wind energy, which accounted for 84 per cent of the growth. A third of global power capacity is now based on renewable energy. 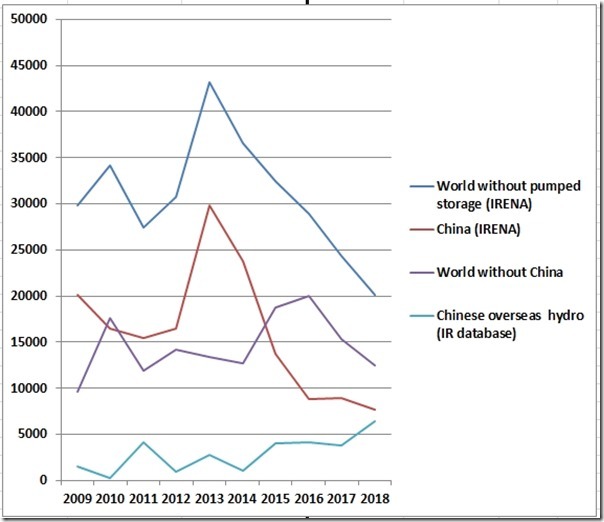 Hydropower: Growth in hydro continued to slow down in 2018 being below 21 GW, with only China adding a significant amount of new capacity in 2018 (+8.5 GW including 1 GW pumped storage). Also Brazil added 3 GW, Pakistan 2,5 GW, Turkey 1 GW. Remaining 5 GW widely distributed in small additions among various countries. Statistics is likely incomplete ( since previously reported 2017 figures were also slightly corrected due to new data submission by countries). All in all hydropower capacity increase in 2018 is 17% less than in 2017 and signifies steady decline for the fifth year in a row).